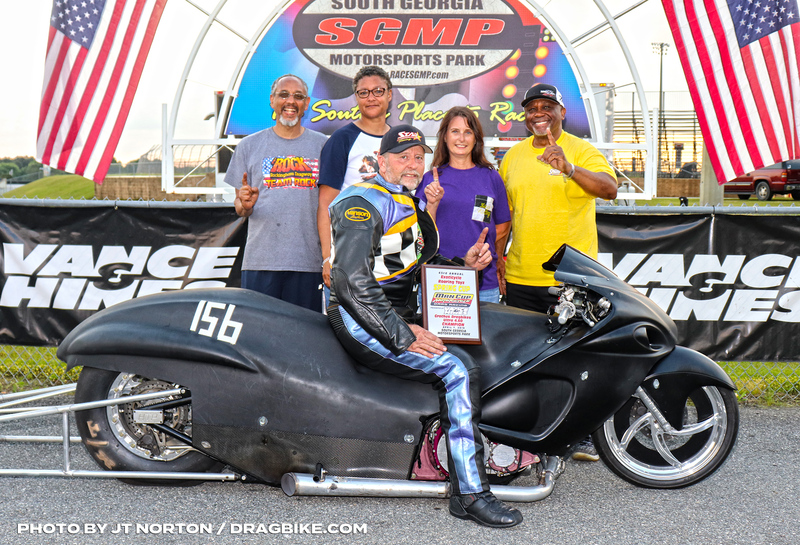 The 38th Annual Exoticycle Spring Cup event, presented by Roaring Toyz was hosted by the Man Cup motorcycle drag racing sanction on April 5-7, 2019, at South Georgia Motorsports Park near Valdosta, Ga. While threatening weather kept lesser racers away, the Man Cup faithful attended in force and weathered any storm to go racing with Man Cup and compete against the best of the best. The ninth season of Man Cup competition is now underway and all indications are this will be a banner year for Man Cup racers as well as the sanction. The Man Cup core staff were on the property at SGMP on Wednesday at noon, setting up all the HQ necessary elements to host a major motorcycle drag racing event. 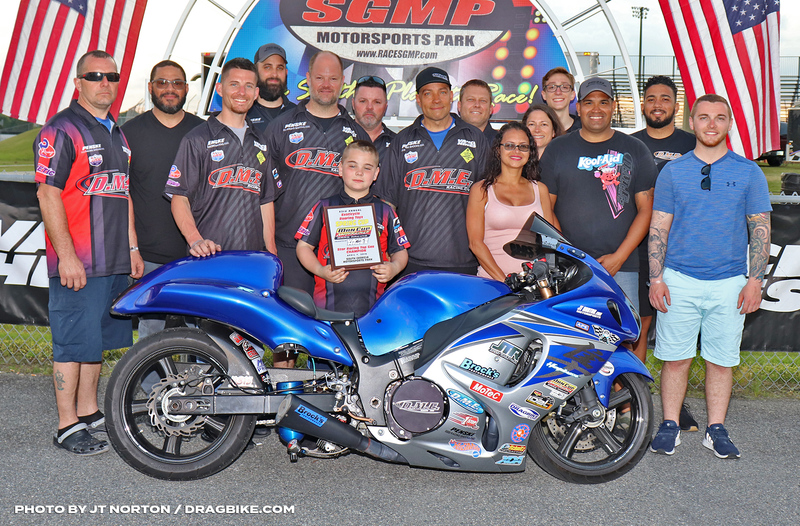 SGMP’s track GM, Nelson Hoyos led the way all week in preparing the racing surface and legendary track prep-expert Wade Rich was in attendance as well, ensuring the racers had a tight track to work with. On Thursday, some racers rolled in early for easy setup and some test & tune action. During the 12 noon to 7pm testing, runs were made by; Larry McBride, Dave Vantine, Eric McKinney, Ashley Owens, Spencer Allen, Jones Racing, Jean Gosselin, Niki Zack, Mark Rendeluk Billy Vose, Chris Connelly, Jason Dunigan, Frankie Stotz, Louis Hornedo, Tommy Saxon, Jayson Geerman, Michael Daddio, Mike Kovacevich, Jack Young, Spencer Claycomb, Chris Jones & TT Jones, several Grudge bikes and others. McBride racing made 3 test runs, Dave Vantine 2, Mitch Brown 1. Larry’s #2 run was his best of the day. On Friday, April 5th, overnight rain had everything soaked. SGMP staff, led by Nelson, was out on the track brushing the water off, just after 7 AM. There was a heavy cloud cover present and occasional water droplets falling from the sky. The heavy fog persisted until 10:30AM. The sun broke through at just about 12 noon and by 1 PM, test & tune began. Racing stopped at 4:25 PM when a heavy shower passed through. Diligent work by the track staff had the track 90% dry at 5:30 PM and at 5:40, the rain came back through once again. The track was well along in the drying process when another rain shower came in at 6:18 PM, washing out racing for the day. No qualifying runs were recorded on Friday. On Saturday, there were no weather-related interruptions to the racing program from 9am through the midday. The entire race program was moving at a quick pace. Things were going so good Man Cup decided to run a Q-3 session for the pro classes, to give them back the one lost out on, due to Friday’s rain out. There was a rain delay at around 4PM, which held up the race program till around 6 PM. 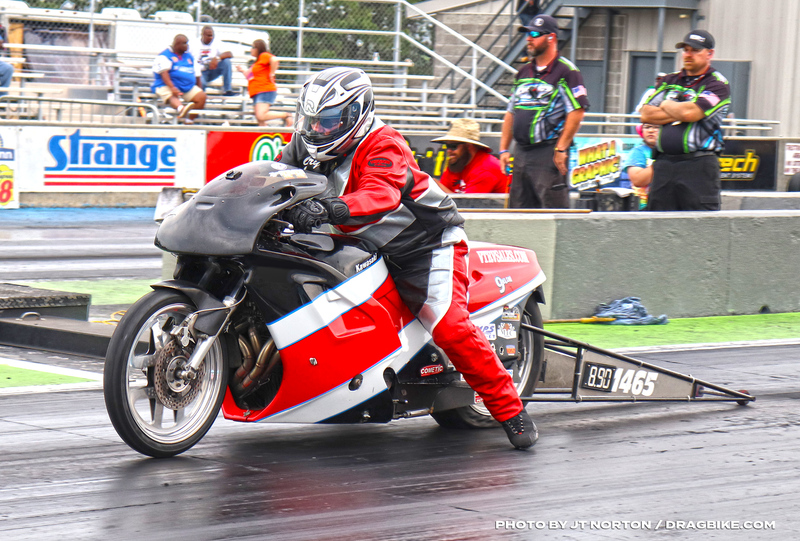 During racing competition on Sunday; Pingel Top Fuel Motorcycle led the professional show. Sverre Dahl of Norway, unfortunately, injured his one-of-a-kind Top Fuel motor during qualifying and could not make the call to face Mitch Brown in round one competition. So Mitch Brown on Dennis Bradley’s Top Fuel motorcycle elected to break the beams and move to the next round to prevent further damage to the engine their already hurt engine. Dave Vantine was set to face Don Becker, who recently completed his license runs on his Top Fuel Harley, but Don Becker could not make the call and Vantine delivered a competition solo pass of 6.094 @ 183 MPH. His half-track numbers showed he was on a solid 5-second run, but something went away in the combination and he slowed to the aforementioned numbers. Chris Hand then matched up against Larry McBride and they left the starting line together but Larry lost traction quickly as Chris Hand pulled away and also lost traction about midway into the run. This resulted in a peddle fest as neither veteran Top Fuel pilot was willing to give in and Chris got to the finish line first with a 6.11 elapsed time at 198 MPH as a rampaging Larry McBride thundered past him at the last possible moment posting a 7.03 at blistering 241 MPH! This advanced Chris Hand into E-2 where he had the bye-run as Vantine matched up against Mitch Brown. Mitch knew his motor was hurt but they were ready to give it their best shot. 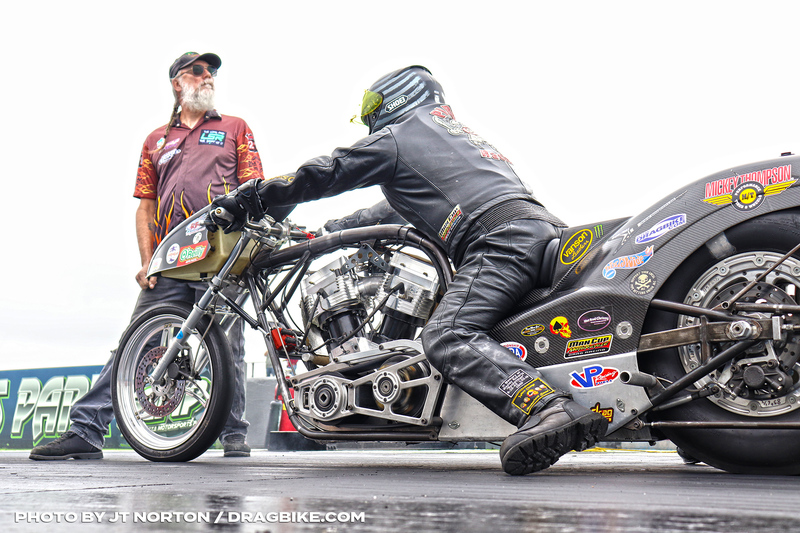 Mitch gave a good performance posting a solid 6.27 @ 212 MPH but Dave Vantine left the starting line like a cannon shot. 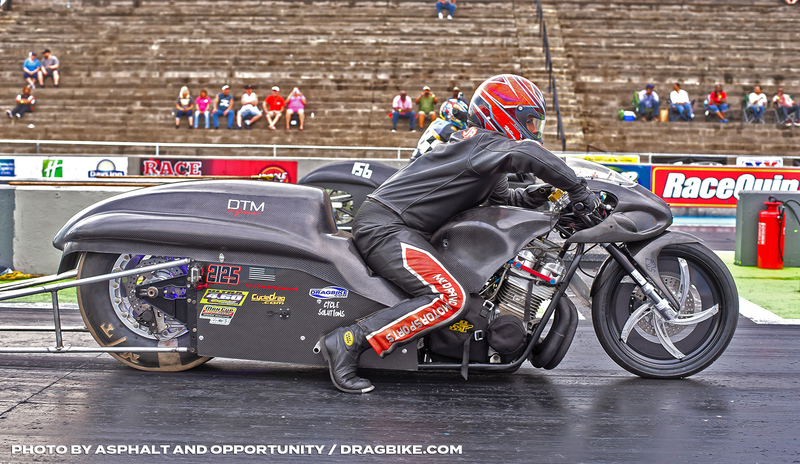 Dave Vantine responded with a personal career-best 5.745 @ 254.33 MPH! Sitting in the frame rails of Dave’s bike was a borrowed motor from Larry “Spiderman” McBride with the numbers 102 stamped on it. 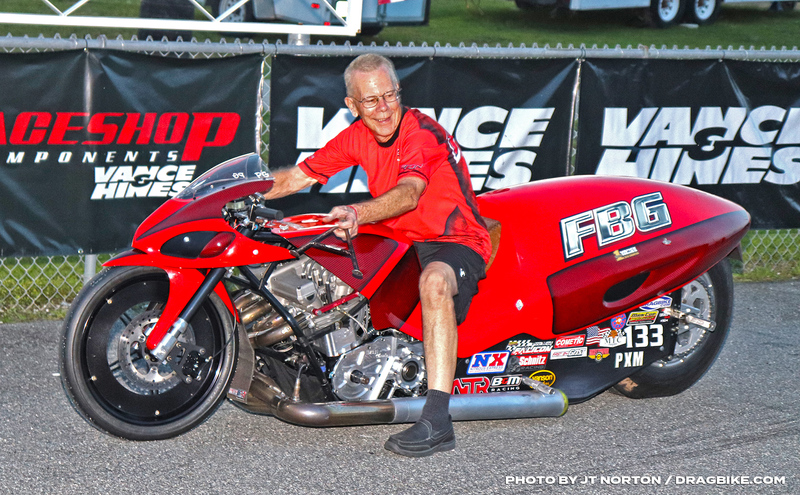 Elmer Trett, during his early days of Top Fuel motorcycle drag racing sometimes wore that number adorned on his Top Fuel bike and Larry, always mindful of his mentor, has a special bullet with the numbers 102 carved into the engine block. When the time to fire up was delivered for the final round in Pingel Top Fuel, Chris Hand and the Red Neck Express could not make the call, necessitating a competition single for Dave Vantine. With motor 102 still in the frame rails, tuned by Greg Pollard and Nitro-Joe, Dave snapped the throttle open and posted his second consecutive five-second elapsed time: 5.93 @ 253.71 MPH to take the win and the points championship lead. In Hawaya Racing Pro Fuel, #1 qualifier Preston Bartlett, by virtue of his quickest ET during the qualifying rounds, earned a bye run on the unbalanced ladder and he posted a 7.34 @ 174 MPH, just a tick slower than his 7.28 in qualifying. 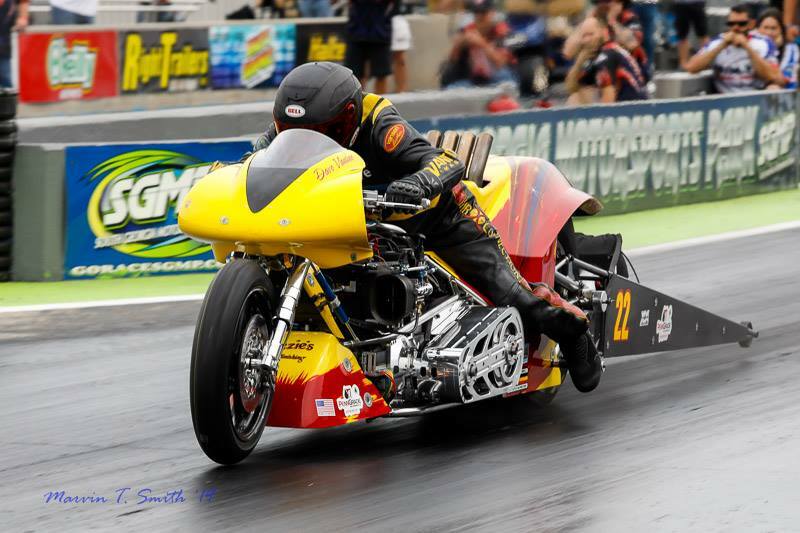 Former Man Cup Pro Fuel champion Tyler Wilson was set to face Sam White during E-1, but Sam’s bike failed to fire. Tyler shut his pike off in an effort to give Sam time to figure out his problem. While Sam’s crew was trying to ascertain why he had no sark, Tyler and his crew pulled the plugs, spun the motor over and cleared the cylinders and prepared for re-ignition. The Chief Starter for SGMP gave ample time for Sam and his crew to find their problem, but eventually had to order Wilson’s team to fire up. Tyler didn’t want to, but he had no choice. Wilson then delivered a 7.49 @ 173 MPH to advance from the round. 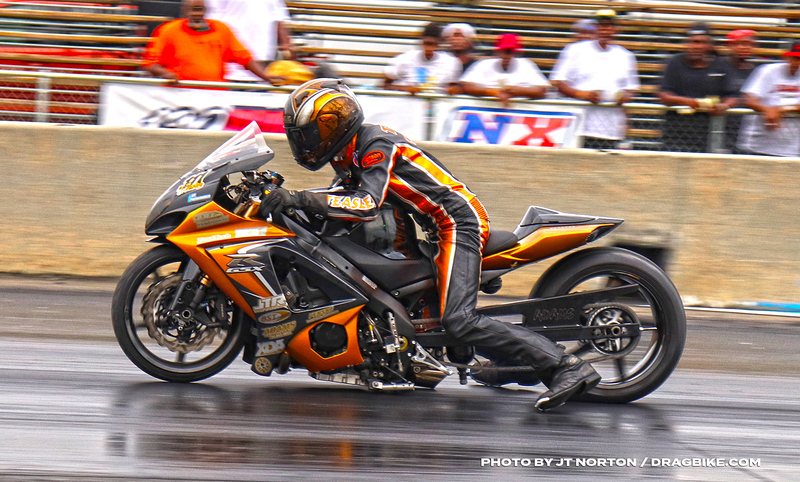 Rocky Jackson, also a former Man Cup Pro Fuel champion was then slated to meet up with Jim Martin, but Jim’s bike had problems resulting in “the Rock Stone” performing a competition single. In E-2 action, Preston Bartlett then put away Rocky Jackson, 7.30 to 7.99, sending Preston on to the final round. Tyler Wilson, on a bye run launched hard and coasted to complete his pass. This set up the final round match-up between the two champions Preston Bartlett and Tyler Wilson. The final round match was a good one with Tyler delivering an aggressive hole-shot .062 reaction time to Preston’s .118 and they traded the lead well down track into the run. 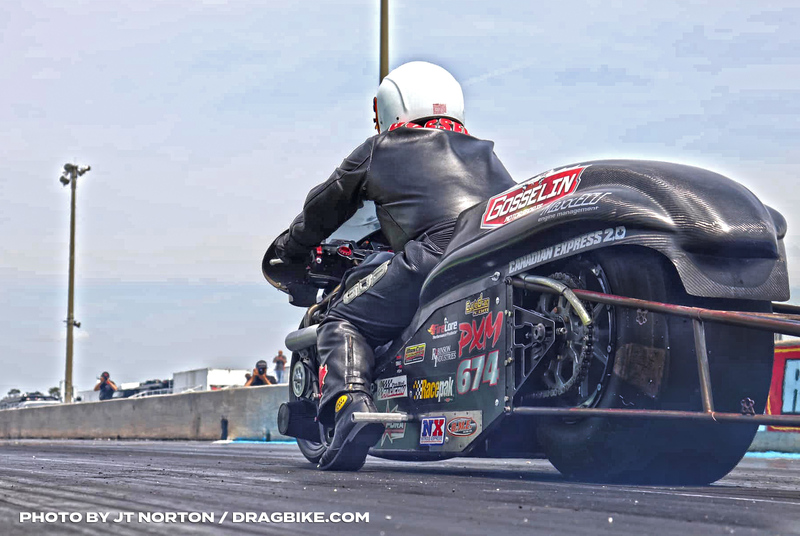 Preston got to the finish line first with a 7.36 at 174 MPH to Tyler’s 7.48 @ 173 MPH, resulting in Preston’s first win of the 2019 season in defense of his #1 Hawaya Racing Pro Fuel championship plate. The Falicon Pro Mod racing was just monster at this race. Paul Gast, who is always a strong performer, flexed his muscles during qualifying with a 4.006 for the number one spot and he then proceeded to cut through the Pro Mod competition field like a hot-knife through cold butter. In E-1 Paul had a competition single when Mike Chongris broke and could not make the call. Paul then came out against McKinney Motorsports heavyweight Ashley Owens during E-2 and he strapped a .009 RT on him and while Ashley’s .055 RT was a reasonable launch, it put him behind the curve in the short 1/8th-mile match up. Both racers posted excellent times, with Gast’s 4.049 to Owen’s 4.082 just a hair behind at the stripe. During E-3, Paul was more than ready for Spencer Allen who was having a great race, until complications set in after his two round wins and he could not make the call for the round. So Paul Gast soloed into the finals as Chris Garner Jones dispatched Terry Schweigert 4.034 to 4.082 respectively. In the final round, the Jones Racing machine which had been delivering 4.0’s all weekend gave Chris Garner Jones a 4.11 elapsed time to Paul Gast’s 4.02 and Mr. Gast hit the win stripe first to start off his 2019 season with a win and a smile. The 2018 Man Cup Pro Open champion, Jean Gosselin of Canada knew he was in for a great race in the Nitrous Express Pro Open category of racing when he saw Niki Zak and Mark Rendeluk were entered for the event. Jean enjoys a challenge, that’s why he races in Pro Open. His low qualifier position served him well, earning him a bye run during E-1 competition. In E-1, Jean faced off against former Pro Open champion Rob Giard. Jean left the starting line strong and Rob suffered problems early in the run as the Canadian Express stormed off into the finals. Niki Zak and Mark Rendeluk matched up during the second round with Niki getting the better of this round of racing, 6.50 to 6.58 respectively. As Jean and Niki staged for the final round, a staging duel ensued and Niki left early. This resulted in Jean Gosselin motoring down the 1320 for his first win of 2019 in defense of his Pro Open #1 plate. 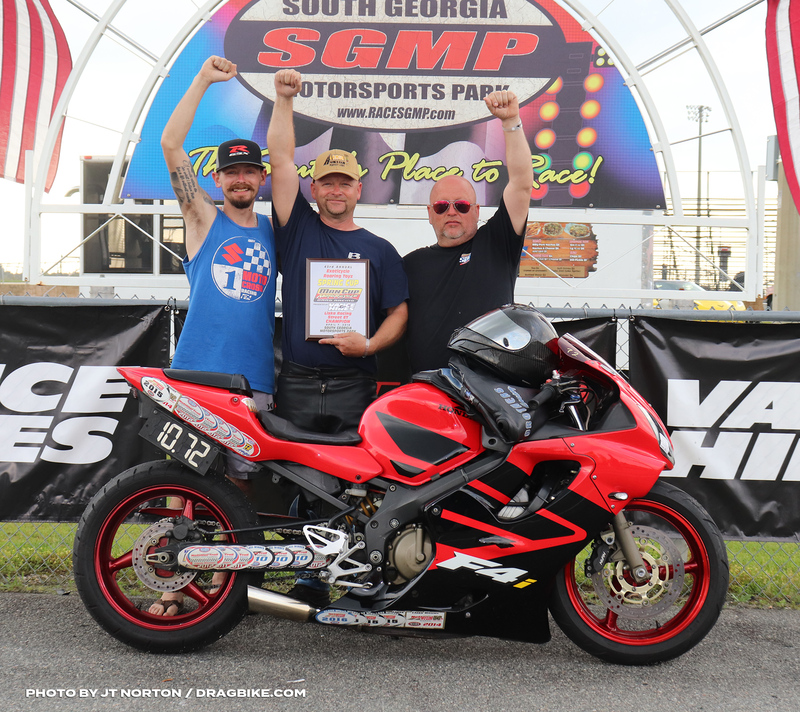 In APE Pro Street competition, all eyes were on the GSX-R1000’s. Last year at the final Frankie Stotz ran 6.60 four passes in row putting him on the cusp of the first 6.5x pass in Pro Street history. 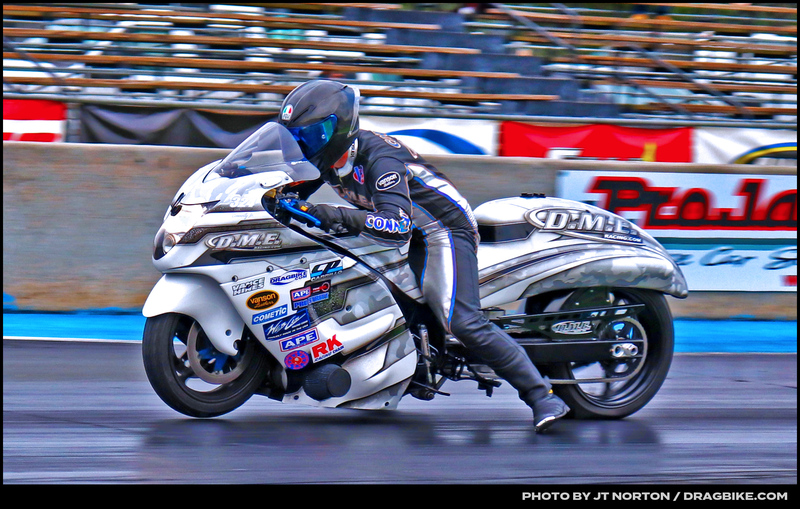 And then earlier this year DME Racing debuted their Chris Connelly GSX-R1000 ridden by the GOAT, Jeremy Teasley. 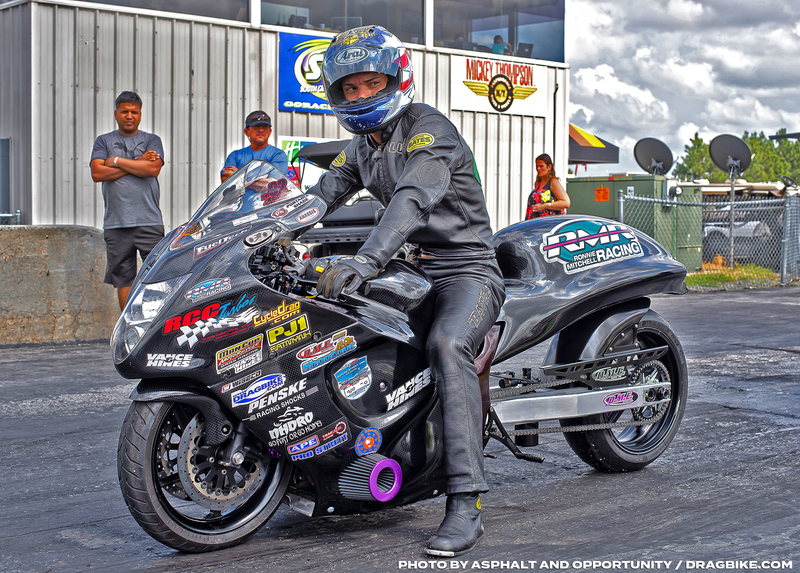 During a private test session at Orlando Speed World Teasley tamed the new 1000 and rumor has it he may have ran a .5X pass. Maybe he did, may he didn’t, but fans have been waiting to see if this new bike would dethrone Stotz from the top of the Orient Express Pro Street GOAT list. In qualifying Teasley came out on top with 6.649 qualifying pass while the best Stotz could squeeze out was a 6.785 in round two of qualifying. 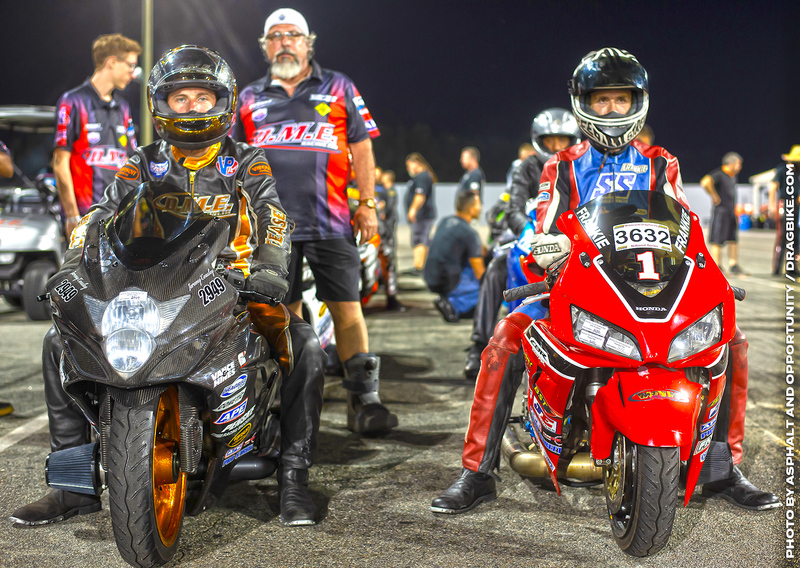 For round three of qualifying the duo agreed to run each other side-by-side in a last attempt for a 6.5x before eliminations, and the Trash Talking on the internet went like wildfire as the keyboard racers placed their bets. Stotz wore out his two-step in the pits as Kent prepped the bike for this round. In the matchup Teasley lost traction a few feet out and Stotz lost power at half track disappointing fans and leaving the first 6.5x on the table for someone else to grab. In round one of eliminations, Teasley ran a 8.672 to take out teammate Jason Dunigan who lost traction right off the line and aborted the pass. Stotz took out Kovacevich with his best pass of the weekend, a 6.669 to his 7.187. 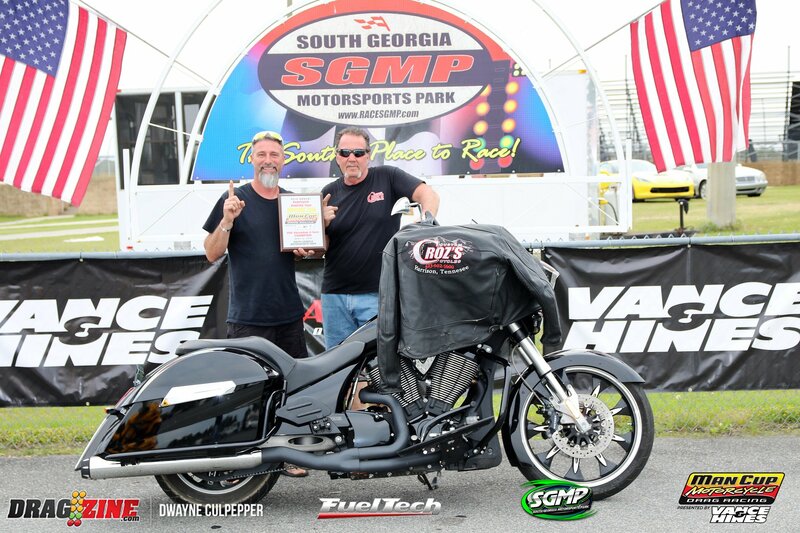 Carlos Olivio who purchased Scott Crawford’s bike at the end of 2018 was running strong with a 6.99 to take out Sydney Marshall on his 7.38 pass. Consistent Chris Connelly Jr took out Luis Sierra with a 6.844 to his 7.268. 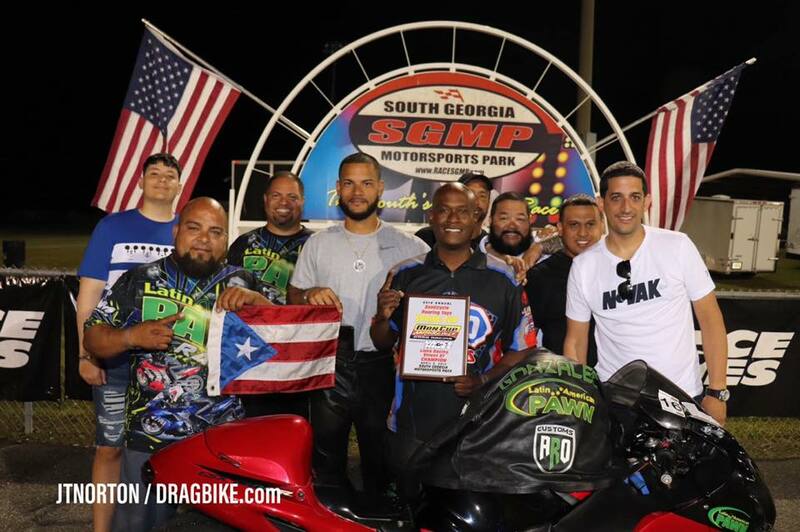 And with Man Cup’s unconventional 9 bike ladder that gives the first-round bye to the #3 qualifier, Luis Hornedo with a no pressure pass, and ran his personal best of 6.836 at 209.14 mph. In round two of eliminations teammates, Connelly and Teasley were paired up, and Connelly got the better of Teasley on the tree with a .047 reaction time to Teasley’s .099, Connelly made a nice smooth pass while Teasley had to fight the 1000 down the track eventually letting Connely get around him for the win with a 6.819 to his 6.951. Hornedo gave the round two win to Olivio when cut a -.002 red light. And Stotz who blew his motor after the finish line in round one barely made it back for round two, but since the #2 qualifier was given the round two bye, he was able to just break the beams under power and head back to the pits to keep wrenching. In round three Connelly had the bye, and Carlos Olivio took out the little red Honda with a 6.921 to Stotz’s 6.949 sending Olivio to his first Pro Street final. Connelly who is no stranger to a final was ready to throw down his best pass of the weekend against Olivio. But Olivio made it easy on him as he jumped the gun with a -.309 red light giving Connelly his third career Pro Street win! Connelly took his time on the tree and then ran a solid 6.795 to make sure everyone at the track knew he was going to take that win either way. While Pro Street was not Jeremy’s cup of tea this event, his racing efforts in Shinko/WPS Real Street were definitely his Sweet Tea of the weekend. Teasley was the #1 qualifier in Real Street with a 7.74 and he dispatched all comers during Sunday’s matchups. In E-2 he took out Johnny Dobrin, 7.84 to 8.06, then outperformed Anibal Merced, 7.79 to 7.83 to advance to the final. There he was set to meet Marcus Hylton. Marcus started having ignition problems in round two and was unable to get them ironed out when the final rolled around. 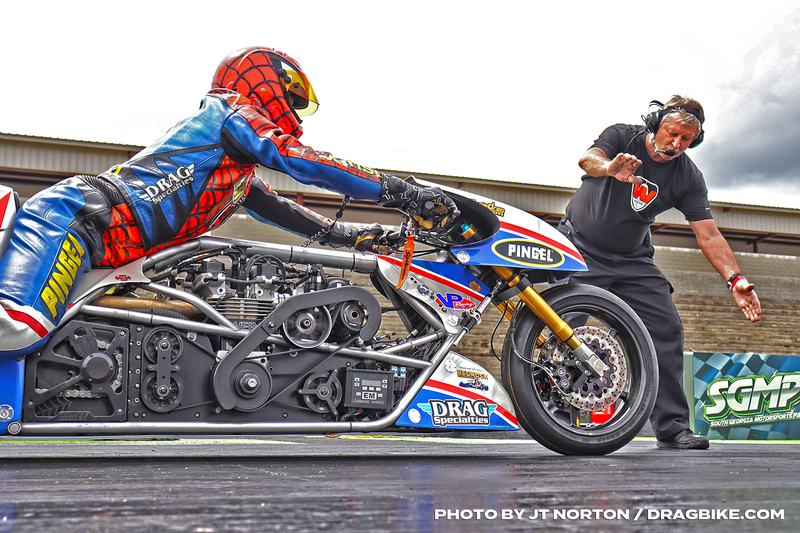 The bulbs dropped and Hylton’s bike didn’t move, and Teasley stormed down the 1320 to post a 7.708 @ 183 MPH, almost setting a new Real Street record in the process. In Round 3 of Qualifying, Spencer Claycomb went down as he went through the finish line due to loose bolts in his lower triple tree. Spencer was transported to the hospital but only sustained minor injuries. He has already started the work of getting the bike ready for XDA in two weeks. The ‘Amish Assassin’ will not be deterred! 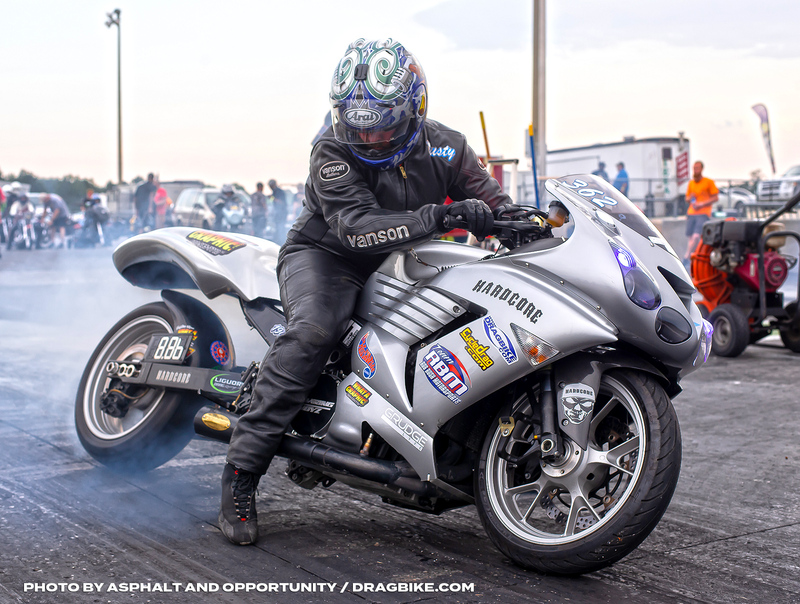 The sportsman racing was also very strong at the 38th annual Exoticycle Spring Cup event. Grothus Dragbikes Ultra 4.60 was as tough as ever. 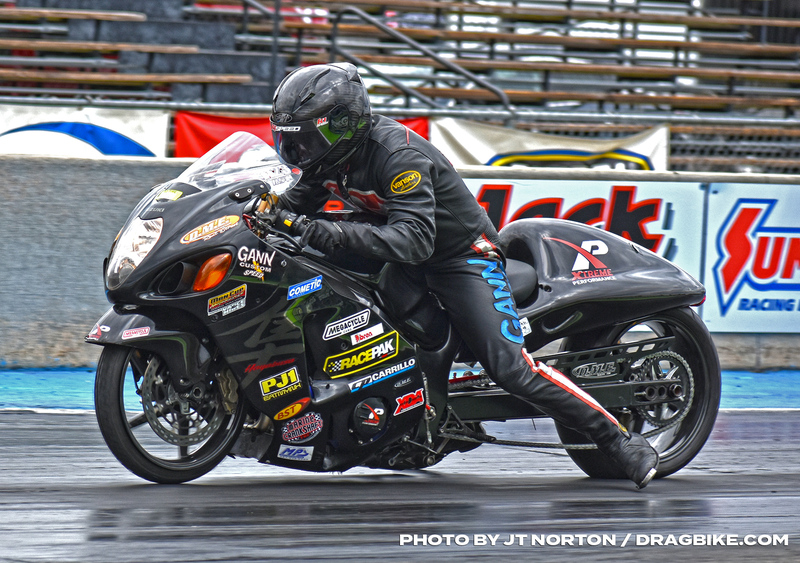 #1 qualifier Brody Grothus who stepped to the front with a 4.606 elapsed time certainly had the goods to win, but he was nipped in E-1 by Ralph Medrano Jr. 4.673 to 4.671 with the reaction times of .072 and .076 spelling a victory by thousands of a second for Ralph Medrano Jr. The talented Mr. Medrano the dispatched Sharrod Fulghum next round and soloed into the final round where he met up with Mike Lingo. Mike Lingo was ready for Ralph with a .029 reaction time and Mike responded with a .076 RT and they charged off to the eighth-mile marker. Ralph Medrano Jr. arrived their first with a 4.591, but when racing on a 4.60 index, this decided the win in Mike Lingo’s favor. Star Power Top Gas racing at this event was as brisk as ever. It’s mighty interesting now to see the number of no-bars bikes racing and winning against the big tire & wheelie bar adorned bikes that once dominated T/G for decades. No one racer better typifies the new breed of Top Gas racers like Jeremy Teasley. His sleek Kawasaki with the extended swingarm is a dead ringer for any of his typical rides and he races it like a battle weapon. 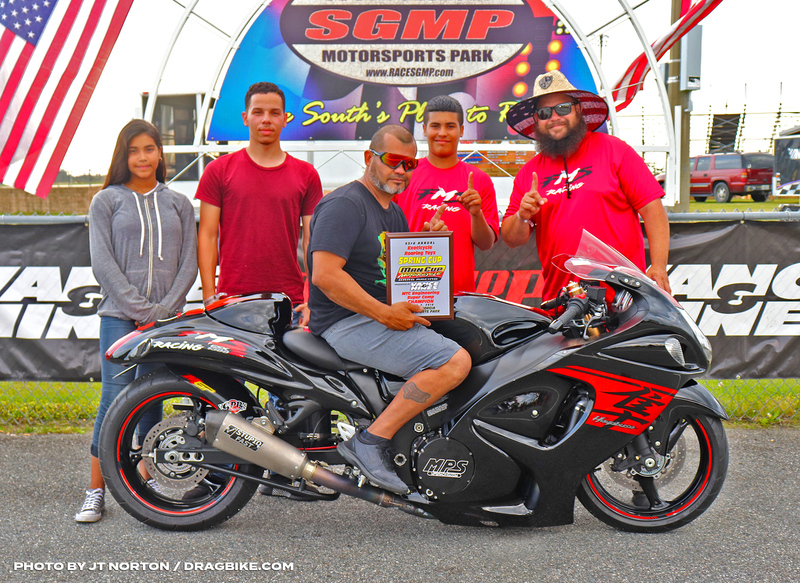 Jeremy used his bike and skills to defeat Scott Saemisch, Ralph Medrano Jr., Michael Daddio and Ricardo Marte, on his way to the winner’s circle at the Spring Cup event. Teasley’s skills are becoming the stuff legends are made from. In MTC Super Comp, #1 qualifier Joe Klemme was handing out driving lessons all weekend and looked like he was on his way to victory. He tore through the first three rounds of eliminations like a scythe and his momentum was there till he met up with Rafy Santos in the semi-finals. There, Rafy put a holeshot on Joe Klemme, .029 to .048 and this caused Joe to push a little too hard at the stripe, resulting in a break out by Joe Klemme. Santos then went on to the final round where he matched up with David Fletcher and defeated him 8.91 to 8.92 in a close one for the win. Wiseco Street Fighter at this Man Cup event was well attended and the racing was top shelf. While Fittipaldi Pieterz, was the #1 qualifier, he had a great weekend of racing until E-3 where he met up with Dusty Brazel, a racer who is always a threat in any class he competes in. Dusty took him out with a holeshot, then pushed on to E-4 taking out Beau Burgess, during a double-break-out pass in his favor. In the final round, Dusty again had a holeshot advantage over Robert Meeks who was forced to push the stripe too far, resulting in a double breakout victory for Dusty Brazel. MPS Pro ET was won by Gary Russell on Saturday over Max Niesen when Max cut a -.003 red light. Sunday saw the same kind of final. DavidFletcher knew he had to push the tree with Ralph Medrano Jr. cutting a .008 and .000 lights in the two previous rounds of competition. 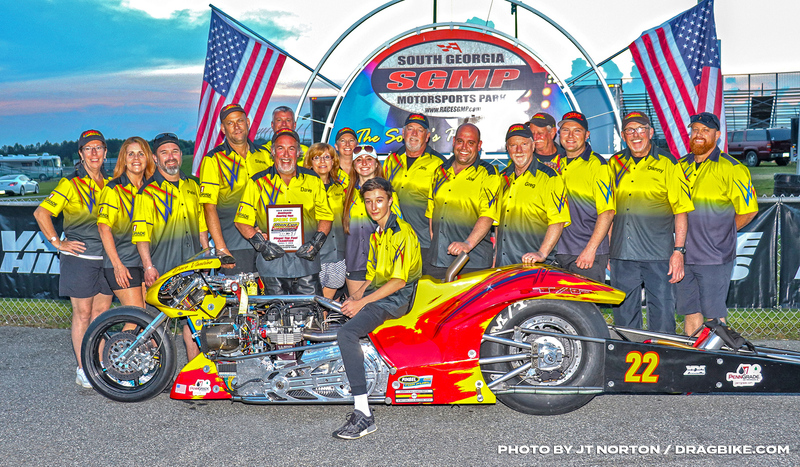 But Fletcher pushed too hard and cut a -.007 light handing the win at the tree to Ralph Medrano Jr.
Liska Racing Street ET was won by Pablo Gonzalez on Saturday over Fittipaldi. Gonzalez won six rounds before earning his win at the tree. Pietersz cut a .209 reaction time which was no match for Pablo’s .048 light. On Sunday Bob Burt took the win over Randy Parker in one of the most exciting matches up of the class. Burt cut a .009 to Parker’s .005 light sending them off the line with no advantage. Burt had the better package running 10.760 on his 10.72 dial, while Parker ran a 9.087 on his 9.04 dial. 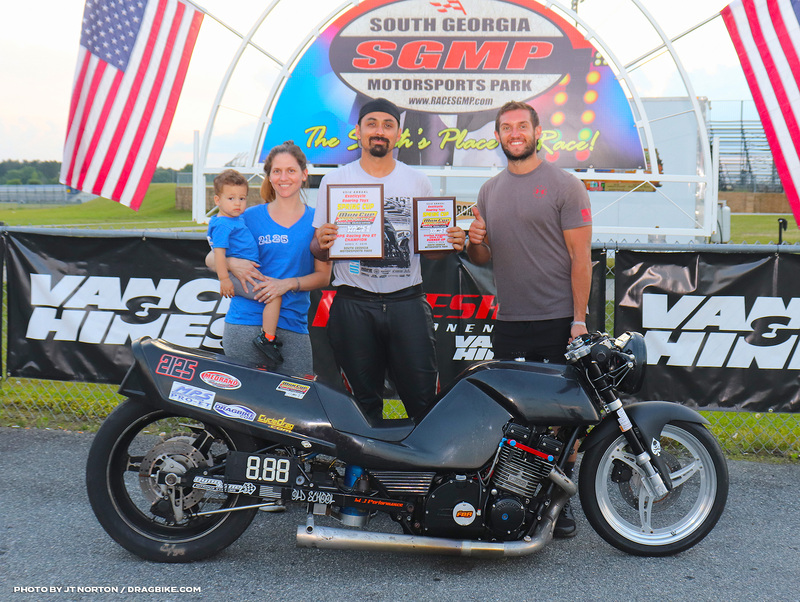 The Vance & Hines Race Shop sponsored V-Twin class was won by Loren Potter on Saturday. Loren won three rounds before facing off with Vance Houdyshell in the final. Potter took an easy win Houdeyshall red lit with a -.011. 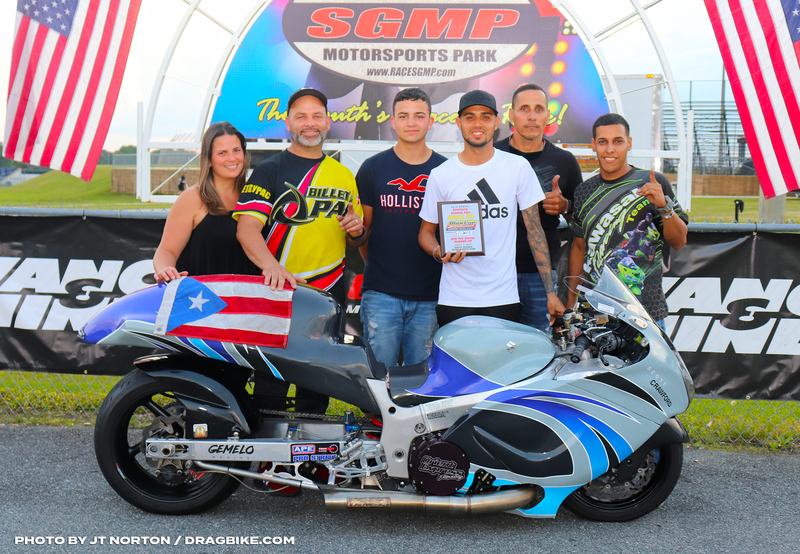 On Sunday Freddy Barreiro took the win on his 2011 Yamaha over Jon Ard. Ard took a nap on the tree to let Barreiro get the jump on him off the line, and he couldn’t make it giving the win to Freddy. 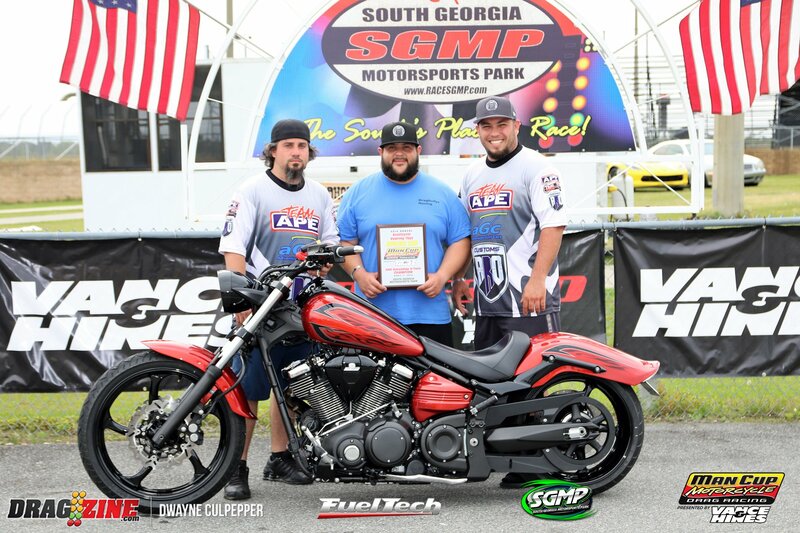 The next race for the Man Cup motorcycle drag racing sanction will be on July 12-14 at Dragway 42, we hope to see you all there.